As a thirty year old I don’t consider myself an age – is that weird? I don’t mean I pretend I’m ageless, more so that I remember (quite vividly) being 21 and 25 and pretty much all the time in between. I feel like those moments were just yesterday, when in fact they were a few years ago, or even a decade ago. Where does the time go?! Somehow I’ve birthed two children, built a home and I’m about to be someone’s wife – it’s quite shocking really. And although I’m quite good at cooking, I still have to phone my mum to help explain how to boil eggs and if there’s something wrong with my car, I phone my dad. So even now that I’m a parent to two mini-men, I also still feel as much of a daughter and therefore a youngster at heart. I realised writing this that it’s actually true what they say: age is just a number. Because I certainly don’t feel like a woman of thirty. Alas, I am though. And while I think I was daunted by the prospect, the reality is that 30 feels no different to 25. I didn’t wake up on my 30th birthday and suddenly feel a whole sense of newness as someone entering the thirties club. But there is one thing that’s aged and started to look, feel and be different this year – and it’s my skin. I’m not saying it happened overnight, but somewhere over the last 6 to 12 months my skin has begun to really change. Very subtly I started to notice two areas of my skin begin to look different. The first was the small lines in between my eyebrows and just above on my forehead, and the second was my eyes. It’s a scientific skincare fact that the skin around our eyes is the first place to show signs of ageing and after recent months, I can wholeheartedly agree with this. I don’t know if it’s bad enough that other people would notice a difference – unless it’s on a really bad day. I have noticed it’s even more prominent on days when I’ve had a late night or little sleep – suddenly my dark under eye bags and fine lines like worse – more noticeable. Basically the skin around my eyes is no longer as forgiving and I feel my time of taking it for granted is over. Because even on ‘normal’ days when others might not notice, I have noticed a difference myself – which in turn means I’ve become more aware and self conscious of it. I’d tried eye products before – some worked, some did very little. But I’d never needed them before – they’d just been a nice skincare extra as someone on the cusp of starting to see fine lines. Now I have them very slowly creeping in, I’m someone who needs them. My name is Chloe and I need a good under eye product. I’m not old enough or at a stage where my lines are deep and profound yet. So I guess I’ve literally taken the bull by the horns and started taking care of my under eye as soon as I saw any slight change. 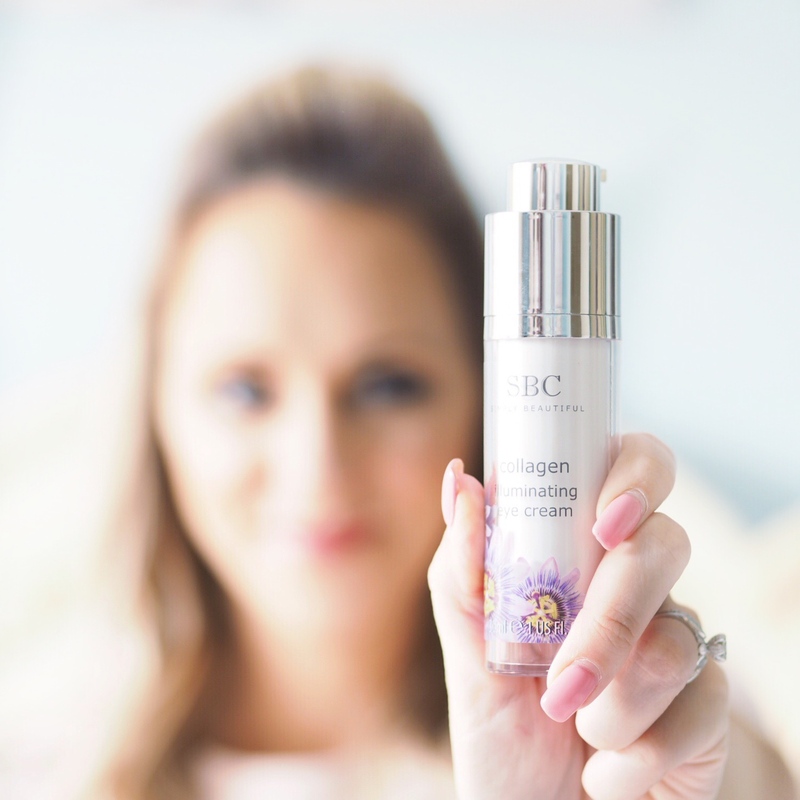 I’ve done this by using the SBC Collagen Illuminating Eye Cream steadily for the past 6 weeks. This highly concentrated eye cream features marine collagen which I know from skincare research is the wonder collagen. This is because it holds so much more moisture and encourages the skin to naturally recreate more collagen on it’s own as well. So not only combating immediate signs of fine lines, but working to get the skin to naturally produce more collagen and elasticity – diminishing the appearance of lines in the long haul. 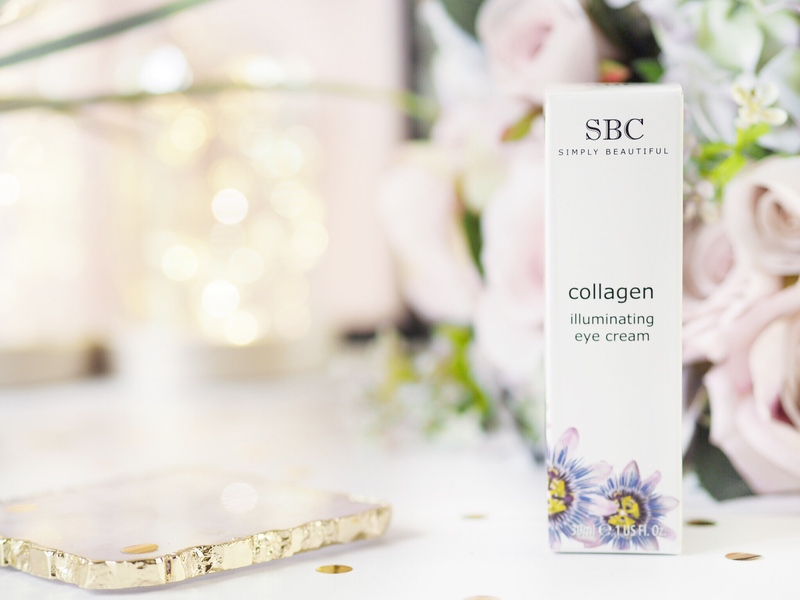 While smoothing out the area of skin under the eye, the Collagen Illuminating Eye Cream also adds a highlighting effect to the area. I need all the help I can get for brightening my under eye – I have dark grey bags that never go away regardless of how much sleep I’ve had. So anything to lighten the way they look is a winner in my book. The pearlescent finish is delicate enough to use in the under eye area without clogging it or it become cakey and patching together. Because that area of skin is so thin, you don’t want something too thick that would patch and look gloopy, but rather something that sits on and is lightly absorbed with no sticky residue. 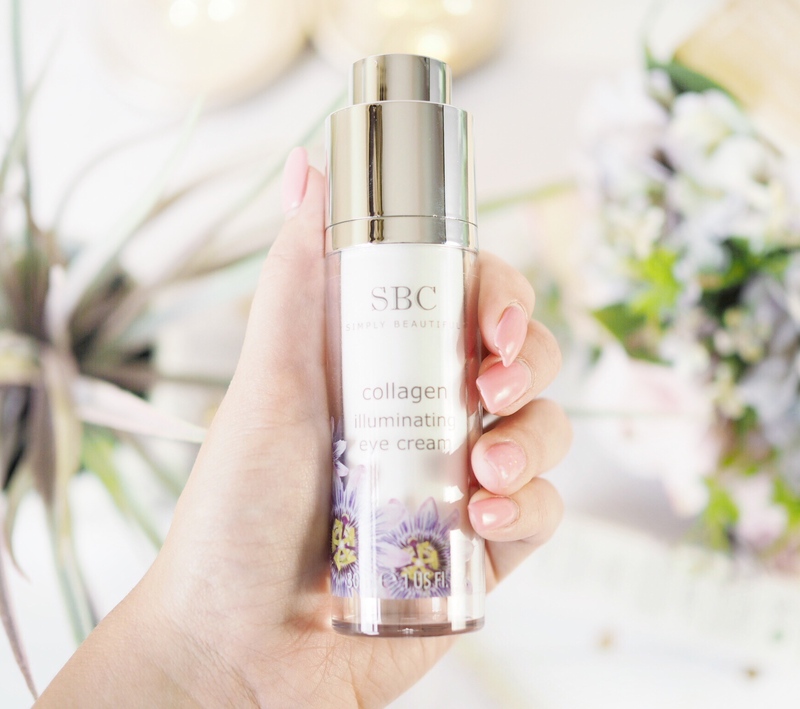 I think the thing I love most about the Collagen Illuminating Eye Cream is the brightening effect it has in that area. It works instantly and just gives my eyes a more awake look to them. Combined with the inner knowledge that I’m looking after my skin with such a well formulated product, using this cream has really helped me feel like I’m doing my absolute best to minimise the appearance of lines and work against premature aging. I’ve also noticed that when I use this twice daily, those tiny lines in the corners of my eyes are softened and blurred and very rarely noticable unless you look closely. 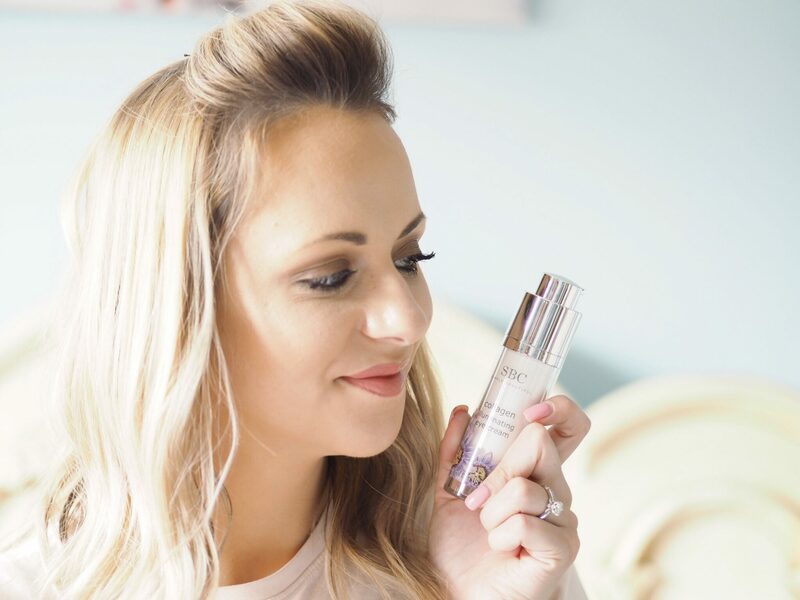 It’s a product like this that all women need as they start to notice their skin change and aging become something that is visible – even if very slightly, like me. While women in their early thirties will rarely have deep wrinkles, we will at some point in this stage of life begin to notice the need for collagens in our skincare because it’s something we lose naturally as we get older. Replacing them and helping the skin to better produce it’s own is the best thing you can do to take care of your skin and prevent premature aging. 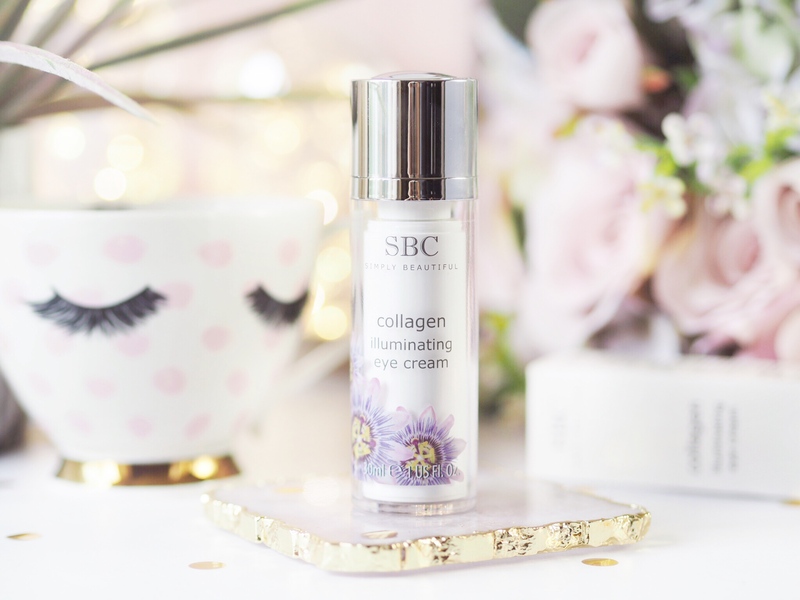 So if you’re in your early thirties too, or have noticed the first few signs of aging: like fine lines and dull patches under the eyes, then I recommend trying the SBC Collagen Illuminating Eye Cream. I’ve never heard of this brand, but it sounds amazing! Anything illuminating around the eye area is a yes from me! This sounds great, I feel like I’ve noticed my skin change a bit too. Im still not sure when to start using anti ageing products! i’m 26 and do now try to make a conscious effort to take some care for anti ageing. i don’t let me face be in the sun without protection and my evening skincare routine has changed slightly! an eye cream is defo somethin i need to invest in! If this is going to help make me look and feel young for a long time then I am allll over that!